Two Tri-Valley League rivals will get a rematch as they open the Class 3A playoffs. The Cherryvale Chargers travel to face the Caney Valley Bullpups after winning the first matchup 22-16 in Week 6 of the regular season. In that first meeting at home, Cherryvale quarterback Cade Addis threw for a pair of touchdown passes, and Trevor Raida rushed for another. Caney Valley quarterback Carter Brown passed for 181 yards in the loss. Since the loss to the Chargers, the Bullpups won three straight to go undefeated in district competition. Caney Valley won those games against Eureka, Neodesha, and Fredonia by a combined score of 150-21. Last week, senior running back Grant Richey rushed for 382 yards and six touchdowns on 18 carries during a 49-14 win over Fredonia. Cherryvale went 2-1 in districts, falling 41-8 to Galena before rebounding to beat Riverton and Southeast-Cherokee by a combined score of 77-6. The Chargers’ only other loss came 22-8 to Humboldt. Caney Valley defeated Humboldt 20-8. On the season, Addis leads the Chargers with 1,028 passing yards and 15 touchdowns. Raida has rushed for 663 yards and eight touchdowns on only 66 carries. Dalton Vail has 14 receptions for 307 yards and four touchdowns. A year ago, Caney Valley finished 9-3 and advanced to the 3A quarterfinals. Cherryvale is back in the playoffs after failing to advance to the postseason in 2016. For the second straight year, Norton (7-2) travels to Marysville (8-1) in a marquee first-round matchup. Marysville has a total margin of 386-157 with the No. 32 SOS in the classification, according to Prep Power Index. Norton is at 307-185 with the No. 17 SOS. Last year, Norton held off Marysville, 28-20, before a 20-0 home loss to Hoisington. In ’15, Norton was the heavy favorite and defeated Marysville, 37-0, at home in the first round. Norton does own solid wins against 6-3 Plainville (40-10), 6-3 Colby (35-6) and high-powered Thomas More Prep (57-15). The TMP victory clinched a playoff spot. However, Norton had significant trouble in its two losses versus its Mid-Continent League rivals. The Bluejays lost 43-0 at Smith Center and 56-0 versus Phillipsburg. 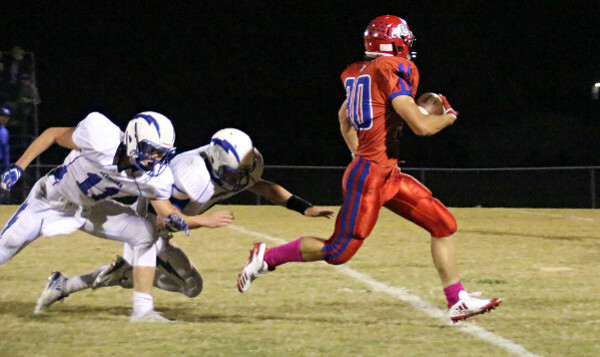 Smith Center has allowed 57 points to lead 2-1A and rank second in Kansas 11-man football. Phillipsburg has permitted 72 points to tie with Nemaha Central for best in 3A. Norton senior quarterback Jace Ruder, a North Carolina commit, has enjoyed his best statistical season. He is 75 of 146 passing for 998 yards with a 11/4 TD/INT ratio. Senior Tevin Petrie has 157 carries for 1,164 yards and 15 scores. Ruder has 103 carries for 967 yards and 14 rushing TDs. Marysville’s only loss was a 22-16 road defeat versus Concordia, a 4-5 team that both scored and permitted 182 points. The Bulldogs won at 6-3 Clay Center (28-8), at 6-3 Beloit (56-28) and versus 7-2 Riley County (26-21) last week to clinch the district title. Coach Dustin Heuer has done a nice job turning around the Bulldogs with a 14-4 combined record the last two seasons and three straight playoff berths. Marysville had lost 32 straight games entering ’15. Senior Jack Blumer threw for 1,372 as a junior and has had an exceptional season with 129 of 183 passing for 2,059 yards and a 24/2 TD/INT ratio. He leads the team with 74 carries for 692 yards and 12 scores. Gabe Pieschl has 39 catches for 944 yards and 12 scores. Marysville has committed just five turnovers and is plus-11 in turnover margin. A key defensive matchup could be the 6-foot-3 Pieschl battling with the 6-foot-3 Ruder, who also starts on defense, on passes. Both are great basketball players, and Pieschl has used his height against some smaller defensive backs this year. The overall statistics, resume and playing at home give Marysville the edge. However, Norton has a tendency to win close games, especially on the road in the playoffs. Last season, the Bluejays beat Marysville on the road. In ’15, Norton won at Scott City, 28-24, in a playoff upset. In his career, Ruder is 4-2 in one-score games, with all four wins coming on the road. That includes a 7-6 victory at rival Phillipsburg in ’15 and a 37-34 season-opening win at Goodland this year. Since the start of ’15, Marysville is 2-5 in one-score contests. Ruder has often had its best performances in games not against Phillipsburg and Smith Center – and generally in the playoffs. Norton wins a close one.